Whit Stillman adapting Jane Austen feels at once apt and almost unnecessary. His previous films—obsessed as they are with manners, social status, and conversational diplomacy—come pretty close to fulfilling any need we might have for a modern-day Austen. Metropolitan’s characters even discuss Austen at length, arguing passionately about Mansfield Park’s virtuous heroine and her relevance to contemporary readers. Some cinephiles may still feel exhausted, too, by the deluge of Austen adaptations that hit TV and multiplexes during the mid-’90s: BBC’s six-part Pride And Prejudice, Ang Lee’s Sense And Sensibility, Roger Michell’s Persuasion, the Gwyneth Paltrow Emma. (These all aired or were theatrically released within a 16-month period, believe it or not.) 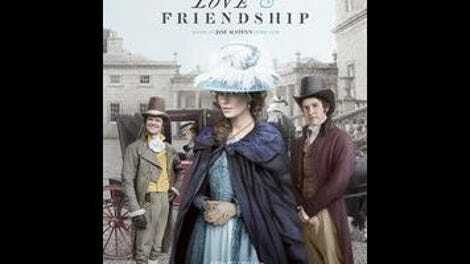 Still, it’s not as if movies today offer such a surfeit of wit and sophistication that one as purely pleasurable as Stillman’s Love & Friendship can be dismissed. If nothing else, it gives Kate Beckinsale, who previously starred in Stillman’s The Last Days Of Disco, a lead role that isn’t a vampire, and doesn’t require her to battle werewolves while clad in black-rubber fetish gear. Rather than take on one of Austen’s canonical masterpieces, Stillman chose to adapt Lady Susan, a novella that apparently never made it past a first draft and wasn’t published until nearly a century after her death. (His new title was taken from one of her short stories.) Lady Susan Vernon (Beckinsale), lately a widow, is unique among the author’s heroines in that she’s not remotely heroic, or even very sympathetic. Rather, she’s a self-centered, manipulative, acid-tongued troublemaker, with a reputation to match. Her primary goal is to find suitably wealthy and pliable husbands for herself and for her daughter, Frederica (Morfydd Clark), toward whom Lady Susan feels mostly pity and contempt. She soon sets her sights on Reginald De Courcy (Xavier Samuel), the ridiculously handsome brother of her late husband’s sister, Catherine (Emma Greenwell), while encouraging an amiable dimwit named Sir James Martin (Tom Bennett) to continue his pursuit of a decidedly unreceptive Frederica. An American friend, Alicia Johnson (Chloë Sevigny, also a Last Days Of Disco veteran), serves as Lady Susan’s closest friend and confidante throughout the scheming. Austen originally wrote many of her novels in epistolary form, converting them into conventional narratives in later drafts. Lady Susan, however, was left as a series of letters the characters write to each other, which means that Stillman was obliged to invent many scenes and much of the dialogue. The result sounds roughly 80 percent like her and 20 percent like him, a pretty delectable ratio. What’s lacking is the deft plotting and emotional complexity of Austen’s great works. There really isn’t much of a story here—the main question is whether Reginald will heed his sister’s warnings regarding Lady Susan or fall into her trap, and he’s too ill-defined as a character for the answer to seem consequential. It’s fun to watch Lady Susan bulldoze her way through 18th-century propriety, but an entire film of wry breeziness is a bit like a seven-course meal that’s all sumptuous desserts. There’s a reason why Austen left this manuscript in the trunk. Fortunately, the cast is having a splendid time. Beckinsale is the main attraction, delivering hilariously cutting lines with the casual cheeriness of someone who can’t even conceive of caring what others might think of her. But she’s ably supported by the entire ensemble (apart from Sevigny, whose speech patterns feel too contemporary, even for an American expat), and willingly cedes entire scenes to Bennett, who makes the relatively minor character of Sir James Martin a doofus for the ages. Any good actor can get a laugh from a choice line—as when Lady Susan characterizes Alicia’s husband (Stephen Fry) as a poor choice because he’s “too old to be governable, too young to die”—but it requires a special sort of genius to be asked “How do you do?” and turn the standard answer “Very well, thank you” into a punchline, which Bennett manages by having Sir James consider the question as if it were a riddle from the Sphinx. Love & Friendship has little to do with either, but it does offer a very amusing portrait of guile and idiocy. Think of it as a divertissement. Both Austen and Stillman would surely approve.